Loreena McKennitt's music and vocals "The Dark Night of the Soul", inspired by the Mystic words of St. John of the Cross, may God be pleased with him. there they dimmed amongst the lilies fair. 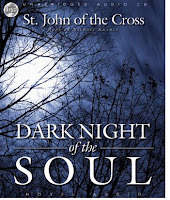 About Dark Night of the Soul: Dark Night of the Soul (Spanish: La noche oscura del alma) is a treatise written by Spanish poet and Roman Catholic mystic Saint John of the Cross. It has become an expression used to describe a phase in a person's spiritual life, a metaphor for a certain loneliness and desolation. It is referenced by spiritual traditions throughout the world. The phrase "dark night of the soul" emerged from the writings of Saint John of the Cross, a Carmelite priest in the 16th century. Dark Night of the Soul, the name of a poem and its theological commentary, are among the Carmelite priest's most well-known writings. The texts tell of the saint's mystical development and the stages he is subjected to on his journey towards union with God. The Dark Night of the Soul is divided into two books that reflect the two phases of the dark night. The first is a purification of the senses. The second and more intense of the two stages is that of the spirit, which is the less common of the two. Dark Night of the Soul further describes the ten steps on the ladder of mystical love, previously described by Saint Thomas Aquinas and in part by Aristotle, referred to by medieval Catholic theologians as the Philosopher, for he established justification for the existence of one true God and thus refuted his master, Plato. The text was written while John of the Cross was imprisoned by his Carmelite brothers, who opposed his reformations to the Order. The "dark night" might otherwise be described as the letting go of one's ego as it holds back the psyche, thus making room for some form of transformation, perhaps in one's way of defining oneself or one's relationship to God. This interim period can be frightening, hence the perceived "darkness." In the Christian tradition, one who has developed a strong prayer life and consistent devotion to God suddenly finds traditional prayer extremely difficult and unrewarding for an extended period of time during this "dark night." The individual may feel as though God has suddenly abandoned them or that his or her prayer life has collapsed. In the most pronounced cases, belief is lost in the very existence of God and/or validity of religion, rendering the individual an atheist, even if they bravely continue with the outward expressions of faith. Rather than resulting in devastation, however, the dark night is perceived by mystics and others to be a blessing in disguise, whereby the individual is stripped (in the dark night of the senses) of the spiritual ecstacy associated with acts of virtue. Although the individual may for a time seem to outwardly decline in their practices of virtue, they in reality become more virtuous, as they are being virtuous less for the spiritual rewards (ecstasies in the cases of the first night) obtained and more out of a true love for God. It is this purgatory, a purgation of the soul, that brings purity and union with God. Among Islamic Mystics, 'The Dark Night of the Soul' experience happened to many, notable classic example is Imam Al Ghazali (1058-1111). Although being a great theologian, brilliant scholar and chief professor, he passed through a deep spiritual crisis in 1095, abandoned his career, and left Baghdad on the pretext of going on pilgrimage to Mecca. Making arrangements for his family, he disposed of his wealth and adopted the life of a poor, wandering Sufi dervish. After some time in Damascus and Jerusalem, with a visit to Medina and Mecca in 1096, he settled in Tus to spend the next several years in seclusion. He ended his seclusion for a short lecturing period at the Nizamiyyah of Nishapur in 1106. His episode of Dark Night of the Soul is portrayed in the Movie based on his life, The Alchemist of Happiness as well. Perhaps the famous utterance of Christ at the cross, "Eli, Eli, lama sabachthani?" which literally is translated as "My God, my God, why have you forsaken me?" was also a moment of Dark Night of the Soul for Christ himself. For many Dark Night of the Soul experience lasted for longer (in causal time dimension), for Christ, perhaps it was a momentary experience of what sufis call veiling.